SAN FRANCISCO -- The Chicago Bears have released defensive end Ray McDonald following a domestic violence arrest in Northern California that police say stemmed from him assaulting a woman who was holding a baby. Santa Clara police Lt. Kurt Clarke reports that McDonald was taken into custody at 7 a.m. Monday on suspicion of domestic violence and child endangerment. Police say he assaulted a woman while she was holding a baby at his home in Santa Clara. He was found about three hours later at a home in San Jose and arrested. Police did not disclose if the woman or the baby were injured. Police were dispatched to McDonald's home in Santa Clara at 3:48 a.m. after a 911 call was made. By the time police arrived, McDonald had already left. 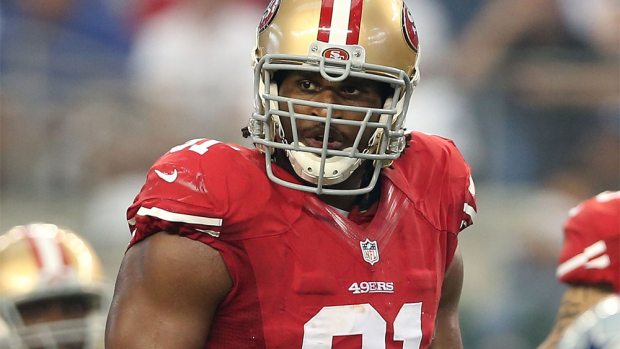 McDonald was apprehended at the home of recently retired Justin Smith in San Jose, CBS San Francisco reported. The Chicago Bears released a statement Monday afternoon about the decision to let McDonald go. "We believe in second chances, but when we signed Ray we were very clear what our expectations were if he was to remain a Bear," General Manager Ryan Pace said in the statement. "He was not able to meet the standard and the decision was made to release him." Pace cont: "He was not able to meet the standard and the decision was made to release him." Bears offensive lineman Chris Long quickly reacted to the move by tweeting "Good riddance." Chicago signed McDonald to a one-year contract in late March knowing it was a gamble given his history of legal issues. Chairman George McCaskey even acknowledged at the time that he initially told Pace not to go after him. But McCaskey came away impressed from a face-to-face conversation that he described as "very candid, very forthright" and "difficult" after McDonald paid his way to Chicago. McCaskey talked to McDonald's parents but didn't talk to any lawyers involved in McDonald's cases or the accusers. He cited a league investigation and said: "An alleged victim I think much like anybody else who has a bias in a situation there's a certain amount of discounting what they have to say. But our personnel department had done its work looking into his background and the incidents and we had the benefit of two coaches who had been with him with the 49ers. "I spoke with Vic Fangio and came away very impressed with what Vic had to say about him, that he's well-liked by his teammates, by his coaches, his strong work ethic. That he's considered a leader on the field and speaking to Vic and Ray especially I was convinced that he's sufficiently motivated to make this work." McDonald's agent, Tom Condon, did not immediately return calls for comment Monday afternoon. In December, the San Francisco 49ers released the 30-year-old, citing a "pattern of poor decision-making." In letting him go late in the season, 49ers General Manager Trent Baalke said, "Ray's demonstrated a pattern of poor decision-making that has led to multiple distractions to this organization and this football team that really can no longer be tolerated." His release from San Francisco came just a month after the Santa Clara County district attorney's office announced it had declined to file charges against McDonald in a separate domestic violence investigation stemming from an arrest on Aug. 31 while celebrating his 30th birthday at his Northern California home. Prosecutors cited conflicting versions of what happened, a lack of verifiable eyewitnesses and a lack of cooperation by the alleged victim, McDonald's fiancee, in explaining their decision not to pursue charges in the domestic violence investigation. She said she went to police after waking up naked next to McDonald. The Santa Clara County district attorney is considering whether to file criminal charges. McDonald had been signed by the 49ers through the 2015 season. He had three sacks in 14 games last year, and had 19 1/2 sacks in eight seasons with the 49ers.